Water lilies are the crown jewel of water plants. Their elegant blooms and large floating leaves add a magical touch to the landscape. Place in large containers on a deck or patio, garden pools, ponds or lakes. Floating water plants discourage algae growth by shading the water and blocking out the sunlight algae needs to thrive. Fertilizer tablets should be inserted in soil close to roots once a month. Always ensure that roots are covered with several inches of water. Do not allow soil to dry out. Heavy loam with top layer of pea gravel. Submerge pot, with 12-18" (30-45cm) of water above soil level. Water plants thrive in wet conditions. There are types that grow in the water and others that thrive in the shallow, marshy areas found around ponds, lakes and streams. Water plants grow well in large containers on the patio or deck. 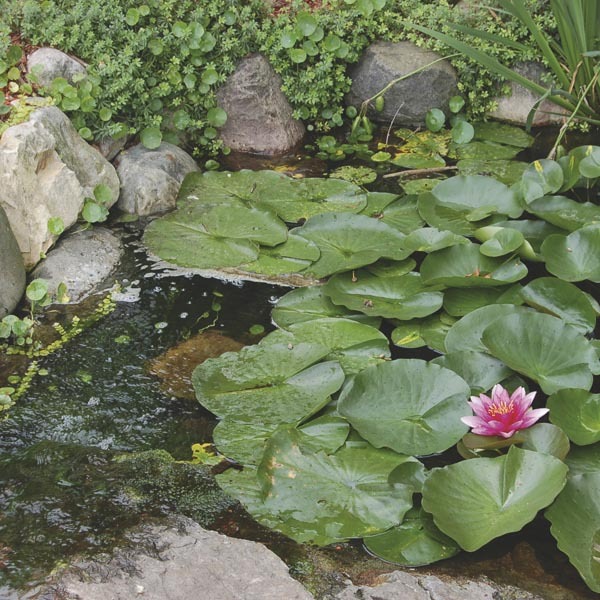 Place a few in a prefabricated pond to add an instant exotic touch to the landscape. Planting in a heavy soil is best. Organic matter may float and won't anchor the plants under the water. There is no need to amend the existing soil. Keep plants moist and do not remove from pots until just before planting. Do not allow roots to dry out. There are two options for planting water plants. Plants can be potted in individual containers and submerged under the water, or they can be planted directly into the soil under the water. If leaving the plants in pots, cover the soil with a 1” (3cm) layer of small gravel to help weigh the container down, as well as prevent loose soil from clouding the water. If planting directly in the ground, dig a hole twice as wide as the root ball and deep enough that the plant will be at the same level in the ground as the soil level in the container. Take care not to bury the growing tip. The growing point for most aquatic plants should be 12-18” (30-45cm) under the water. This ensures that the sensitive growing tip will be under any ice formed during the winter. If plants are in submerged containers, bricks or inverted pots can be used as a base to adjust the height of the containers under the water. Marginal (bog plants), that grow near the water’s edge, should be positioned so that the growing tip is 3-12” (8-30cm) under the water. The depth will depend on the overall size and habit of the specific plant. Floating plants are simply placed on the water, no planting is required. The roots of aquatic, marsh, and bog plants must keep kept moist at all times. During hot, dry weather container gardens and small pools should be checked regularly for low water levels resulting from evaporation. Replace water as needed to keep the roots covered. Take care when applying fertilizers to water plants. Over fertilization can promote algae growth. Slow-release tablets or mild granular fertilizers are a good solution. Tablets can be easily pushed into the soil. Check package directions for proper timing and application tips. Dead foliage and faded flowers can be removed to keep plants looking tidy. Plants that become too large can be dug up, divided, and replanted. Plants growing in pots within containers and pools should be lifted from the water. Then, remove the plant from the pot, divide the roots, repot the plants, and place the pots back into the water.